Great for working with with all metals, including platinum, sponge sanding pads from 3M are flexible enough to conform to almost any contour or surface. Micron-graded abrasives make them safe for every stage of sanding and pre-polishing. Use wet or dry for a wide variety of metal, model-making and lapidary applications. Made of long-lasting, closed-cell foam rubber bonded with aluminum oxide abrasives. Convenient, hand-sized pads can be folded or trimmed to fit into detailed areas. Set of five includes: Medium=160 grit, fine=360, Super-fine=550, Ultra-Fine=900, Micro-fine=1400 grit. 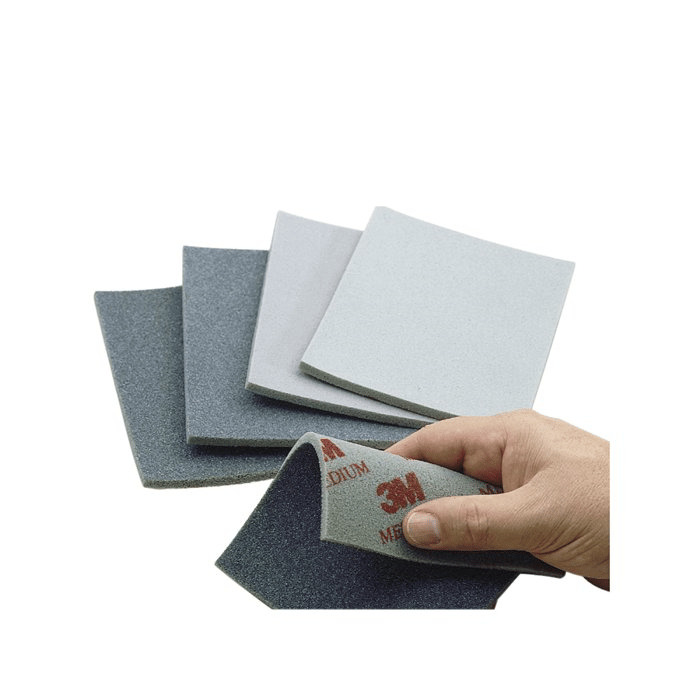 Sponge Sanding Pads Great for working with PMC, sponge sanding pads from 3M are so flexible that they conform to almost any contour or surface. Micron graded abrasives make them safe for every stage of sanding and pre-polishing. Pads can be used wet or dry for a wide variety of metal, model-making and lapidary applications. Medium=160 grit, fine=360, Super-fine=550, Ultra-Fine=900, Micro-fine=1400 grit.